Is ‘Love Actually’ a good movie, actually? Fifteen years after its release, the British romantic comedy — which weaves together nine storylines of mixed quality — has apparently become a holiday film that many view annually. But is it a good movie? At Christmas you tell the truth, so WTOP examines the debate. WASHINGTON — The last thing America needed was another cultural battlefront, yet here we are. The fault line: Is “Love Actually” a good movie? Fifteen years after its release, the British romantic comedy — which weaves together nine storylines of mixed quality — has apparently become a holiday film that many view annually, if social media feeds are any indication. My hot take is ‘Love Actually’ is actually a bad movie. There’s a good reason it’s ascended to this rarefied position: The Most Wonderful Time of the Year is one of sentimentality, and boy howdy does “Love Actually” push that button. Sheriff Rick Grimes’ earnest cue-card love confession to his best friend’s wife? The classic airport scene, when Liam Neeson’s son slips through airport security to confess love to his first crush? The schoolkids’ joyful singing of that classic Mariah Carey song that will outlive us all? The glass is half-full, say the film’s champions. It’s what love and the holidays should be — a heartwarming beacon for optimists, romantics and all that. Follow through on your feelings, confess your love, and your ever after will be happy. But let’s get real here: Matters of the heart aren’t so neatly wrapped up like that. Even healthy relationships are complicated. They require as much maturity as they do a young-at-heart romantic spirit, and that combination is rare. People are flawed, and everyone has baggage. Who gave those Brits the idea that they can fill our heads with this sappy grog? Sure, the film’s execution is more polished than what you’ll see from the Hallmark Channel’s 22(!) Christmas movies this year, but “Love Actually” just inflates expectations in this age of The Swipe-Left. Even the film’s title is problematic. While “Love Actually” is an abbreviation of the film’s theme — “that love actually is all around” — it sounds like the preface to what will be an epic mansplain. Sheriff Rick Grimes’ creepy, stalker-ish cue-card love confession to his best friend’s wife? Liam Neeson’s son somehow slipping around post-9/11 airport security without getting tackled and pepper-sprayed? The schoolkids’ vapid lip-syncing of that overplayed Mariah Carey song that will outlive us all? “C’mon man,” those armchair critics groan. What about bitter breakups and divorces? Rejection? Realism? “Shouldn’t we hold out for the fairy tale?” replies the defender, right before a shoe is thrown at their face. 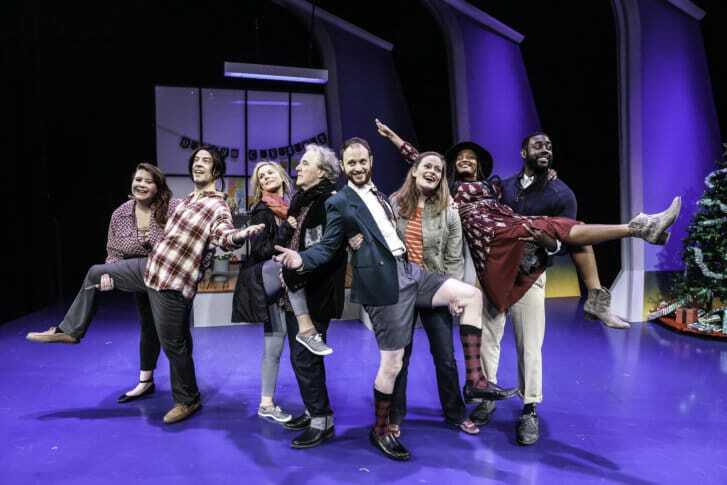 Two fair, balanced experts shared their perspectives on this debate: Aaron Bliden and Mary Catherine Curran, who are in the cast of The Second City’s “Love Factually.” The festive satire of romantic comedies such as “Love Actually” runs through Dec. 31 at the Kennedy Center’s Theater Lab. The show isn’t necessarily a note-for-note parody of each “Love Actually” story. Rather, it flips the script a bit on the major stories, mashes up two of them, adds Jane Austen’s ghost and a rap battle (among other things), and then ends it all in a way that both sides of the debate will appreciate. “Love Factually,” oddly enough, explores both sides of this dividing line — sentimentality versus jaded cynicism. Curran, for one, advises that you not dwell so much on its quality. Rather, consider how it affects you. “I would not say that ‘Love Actually’ is a good movie, but it makes me feel good,” she said. Bliden sees it as a film that accomplishes its goals. Both liked Emma Thompson’s performance in her dramatic storyline. They also liked the story involving the widower (Liam Neeson) coaching his son through a first crush. Then there’s the story involving a woman (Laura Linney) who has to reconcile dating with her sense of obligation toward a mentally disabled brother. “Her love for her brother is the most important love in her life, and I think that’s the thing that they really hit over the head — the different types of love,” Curran said. These sensitive narratives share the screen with straight-up rubbish. What is up with that creepy beer-commercial storyline in which a British bro flies to Milwaukee (?!?) so he can get lucky with American ladies … then succeeds? Other minor infractions: Why would Colin Firth type up a novel next to a pond, on a breezy day? Who thought that a smug Hugh Grant dance scene was clever? And why exactly are the Christmas pageant kids wearing lobster costumes? We could go on here like a grumpus, or just accept it all for what it is. Dwell too much on the glass’s empty half, and you’ll go thirsty. “Embrace the cliche, for sure, but don’t lose your intelligence at the same time,” Bliden said.